We are agents for the Map3D boundary element software developed by Mine Modelling Limited of Canada. 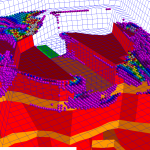 This software has been successfully applied to soil and rock mechanics problems at hundreds of sites in over 20 countries. 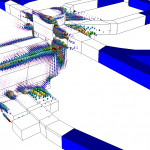 Our consulting business specialises in advanced numerical stress analysis for mining rock mechanics. We have worked on most of the major underground mining projects in Australia including full three-dimensional numerical models. The mine wanted to investigate top down and bottom up stoping and with or without a crown pillar. The concern was stoping induced toe damage and potential for pit wall instability. 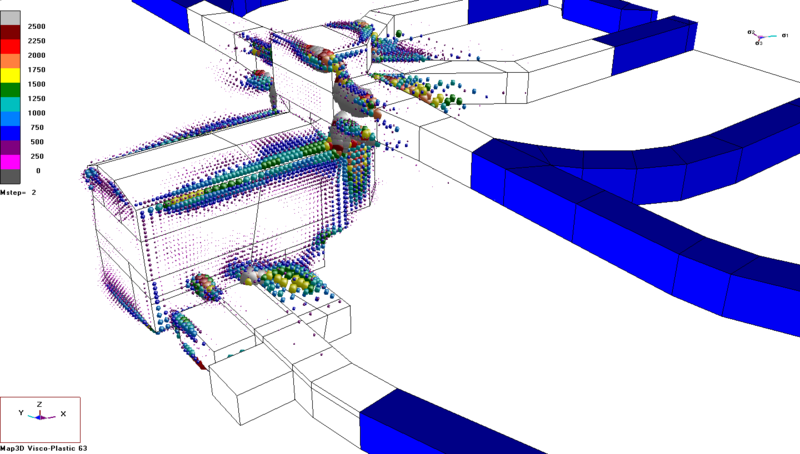 This plot shows accumulated plastic strain around stopes directly underneath the pit (pit walls and floor are hidden and shown as a wireframe). The concern here was the interaction of the stopes and the toe of the wall. Click on either thumbnail image to see the full image.